I've been a fan of The Creeps for a few years now. While some dismiss their dark lyrics as gimmicky, I always found that it was more like the band was picking a specific sandbox to play in. Regardless, one thing is for sure, these fellows sure know how to write some catchy songs. The best part about the The Creeps fixation with darkness and depression is that it keeps their pop punk songs from slipping into something goofy. I can take their music seriously and still appreciate the phenomenal hooks and catchy choruses they're cramming into every song. Every time I write about The Creeps I always end up comparing them to an old 90's band from England called Reverse. In particular, I still think the singers have similar deliveries, but both bands also know the subtle art of making your song full of energy without having to rely on playing it 1000 miles an hour. 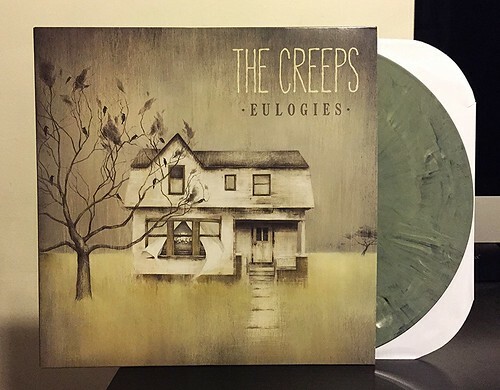 Of all of The Creeps' records I've heard, to me Eulogies is their best. The band has been around for a while and have been getting better and better with every record. They're reached the top of their game with this new album and it's been in heavy, heavy rotation for me since it arrived a few weeks ago. Your Pest Band - Other Bore 7"
Unwound - Kandy Korn Rituals 7"
Unwound - Corpse Pose 7"
The Moderns - When She Gets Back 7"
Unwound - You Bite My Tongue 7"